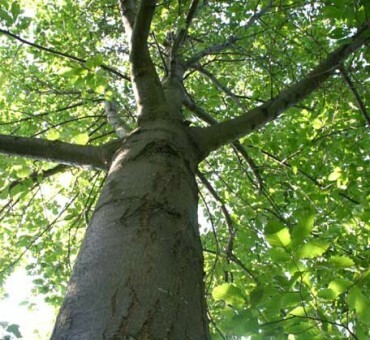 Viva is largest hybrid chestnut tree as welll as the largest tree on our farm that we planted from seed with the largest diameter trunk over 30 inches at the base with a height of 70 ft. This is one of the few hybrid crosses picked at our farm in one of our seed beds showing the greatest growth rate. From comparing it to other chestnuts in this area, we think the growth rings easily exceed one inch annually. Luckily the tree appeared highly resistant to blight. The second generation trees also appear to be hightly resistant after 20 years yet still maintaining that incredible hybrid vigor. Fruiting is light most years which makes it tricky growing seedlings from it. It might be a pollination issue or the tree is naturally low yielding putting all of its energy into growth and not nut production. We have oaks like this as well. They appear almost sterile yet their caliper and height are nearly double that of other seedlings. A straight line wind storm damaged a portion of the tree in 2015 which has further reduced the upper portion of the tree. Its not pretty. This coupled with the low yields of nuts has made it difficult to propagate from seed. Hopefully we will have seeds again in the fall of 2019. Our plans are to cut the tree for lumber as well as graft it as it is such a unique chestnut. No shipment to CA, OR, WA. Self infertile. You need two plants or another type of chestnut.